Tattoos provide unusual snapshots, frozen in time, of a person’s life. Children, immortalized on a bicep tattoo, grow up. Quotations once considered profound may lose meaning after years resting on someone’s ribcage. At least, that’s what happened to one fan of Argentina’s River Plate soccer team who got the QR code linking to a triumphant highlight video. It was an innovative, high-tech tribute. The only problem is that a rival team’s fans responded by flooding to YouTube and reporting the video for copyright infringement as a prank, according to The Independent — which ended up with the video vanishing. 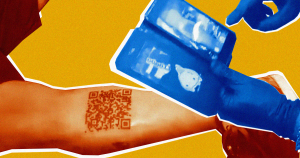 Some QR codes can be changed after the fact, Gizmodo reports, but there’s a chance that the tattoo’s functionality may someday return. A YouTube spokesperson told Gizmodo that the YouTube account to which the tattoo linked set the video to private, perhaps in response to all of the copyright infringement reports.